Thank you so much for the recommendation and for the new station. 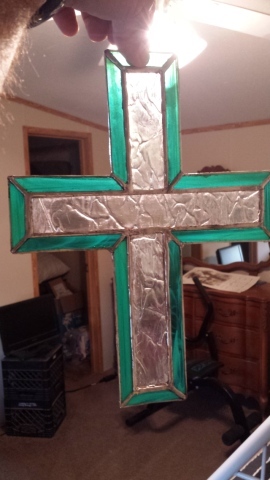 It works beautifully and stays hot forever! I just wanted to let you know I am very pleased with this iron and may order one for my wife as well. The work load here is heavy and the turnaround is as fast as I can make it, so unfortunately I have no pictures of any repair work completed using the V36GL3. I am mainly using Starboard polymer sheets for fabrication of parts and devices, however I also work with PVC and styrene. I am using the 60 watt industrial soldering station for both fabrication and repairs, using it to weld plastic pieces that were previously screwed together. Welding the plastic prevents the occurrence of breakage resulting in exposed screws, which is a common occurrence, and a big safety hazard. The folks I work with are all mentally and physically challenged, and many of them have poor motor skills. This can result in damage to their equipment due to things getting dropped or knocked off tables. Being able to fix broken plastic items is a big money saver, since I have to replace less things that I can now repair. The plastic welding process is a lot like metal welding in that the strongest joint is achieved with the proper preparation and sufficient penetration.. The difference between metal and plastic welding is that with plastic you have to make sure you spend enough time 'under the iron' for both parts and the filler rod to all melt together, so its important not to rush the weld. This requires that your soldering iron has enough heat and the V36GL3 never lets me down, allowing me to perform top quality welds, time after time. I'm also in charge of our fleet of 18 vehicles, which are buses and vans we use to transport our residents to and from our 13 group homes. These buses have molded PVC body panels, and I have been able to use the V36GL3 to repair minor collision damage on these parts, which is obviously way cheaper than replacing them. I've also used the station for traditional electronic soldering, with excellent results. I had previously been using a cheap soldering pencil, which barely got hot enough to melt the solder. The V36GL3 heats up fast, and gives me control of the amount of heat for the job. I do repairs on electronic communication devices that our residents use, and being able to fix these things instead of paying the exorbitant replacement prices is great. All in all, the V36GL3 was a very good investment, and has probably paid for itself already in the money I've saved from fixing instead of replacing. It is good to find a tool that does what it's supposed to do without any fuss. 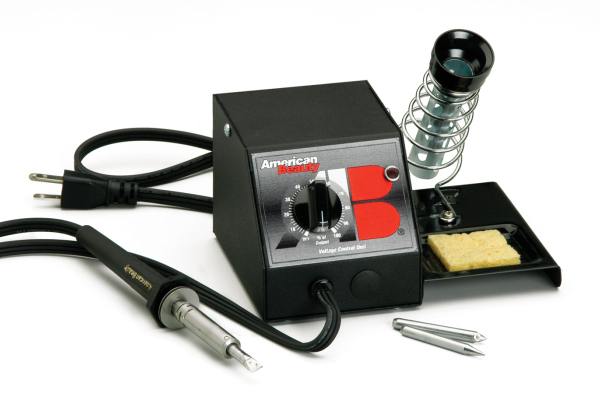 American Beauty Industrial Soldering Stations offer the high thermal capacity of our production-ready pencil irons combined with amazing controllability. Industrial soldering stations are designed and built to perform under the most demanding production line conditions and withstand rugged usage in all maintenance and repair operations. Each system comes complete with three different style soldering tips (Chisel, Diamond and Conical) maximizing the number of soldering jobs you can accomplish with one unit. Also included with the station is a detachable soldering iron holder and tip cleaner. Soldering artisan projects up to medium size. Solid-state voltage regulating device incorporated in each station permits tighter process control, longer heating element life and a reduction in damage resulting from excess thermal capacity. Compact, bench top unit, complete with detachable stand with dross collection sponge helps keep working tip clean and ready to accept solder.